The first step in starting to train for fitness and fun on a bike is obvious. You need a bike! Perhaps you have a bike quietly gathering dust somewhere. If so, great! Just pump up the tires, lube the chain, make sure the brakes work and take it for a spin. For the rest of us, it is time to find a bike. Buying a bike is an opportunity to fall in love. If you choose wisely, your bike will become an extension of your body, a marriage of form and function that you can’t imagine living without. I freely admit that I LOVED my first bike. It was a freedom machine. It liberated me from a lifetime of illness. It showed me the world. It connected me to my community. Every time I rode, I felt better about the world and myself. My experience is not unique. In fact, Coach Kadir just got a new bike and he put together an actual 21-page baby book on it! The picture shown here is of his new bike. So, how do you find the right bike for you? Buying a bike is a HUGE subject. I could write an entire book about it. For our purposes, I will keep it to the basics. This is a tricky topic. You need a higher level of expertise to evaluate the shape and quality of a used bike. You need to know exactly what you want and what size of bike fits your body. It is super hard to evaluate what a bike should feel like, if you are not a regular rider. Unlike new bikes, used bikes do not come with warrantees, set up, or maintenance services. You may also have to buy replacement components like a seat post, saddle, or tires to really make the bike work for you. If you are a tall or large rider, finding a used bike that will fit you is a rare and mythical unicorn. These factors in consideration, if you are patient, you can get one hell of a used bike with robust features and high-quality components for much less than a new bike. If you are less patient and want to reduce the hassle factor, buy a new bike. I highly recommend that you avoid buying a bike at Walmart or another discount store. A new bike in the $150-$300 price range may sound like a great deal, but these are designed for the casual rider. Someone who takes 2-3 rides a year. The components are just not designed to stand up to regular riding or training. A good quality bike can be found in the $500-$1500 price range. Very good quality bikes usually start in the $1500 price range and can go up to $3000 dollars. If you spend more than $3000 dollars, you are paying for high-quality components that reduce the overall weight of the bike or make the bike more reliable in super tough conditions. Top of the line road and mountain bikes can retail for over $10,000! I assure you that you do not need a “pro” racing bike like this to train or have an enjoyable riding experience. Choose a reputable bike brand. Brands like Trek, Specialized, Cannondale, Giant, Scott etc. will serve you well. They will have many models and options to choose from in different price bands. Most importantly, these brands stand behind their bikes with good warranties in case anything goes wrong. For a beginning cyclist, I recommend that you avoid buying a super high-end or overly specialized bike. Don’t buy a trendy fixed gear bike, a beach cruiser, or a neighborhood low-rider. Don’t buy a bike built for pro road races, cyclocross races, time trials, triathlons, ramp jumping, or downhill mountain biking. Also, don’t buy an e-bike unless you have very specific health issues that you must consider. As you gain more experience, you will better learn what kinds of rides you want to obsess over and pursue. Most experienced cyclists own several bikes for different purposes. There’s an old joke in cycling. How many bikes is enough? N+1 where N = the current number of bikes you own. For now, you just need one bike that fits you well. If you have a friend or a friend-of-a-friend who is an experienced cyclist, ask them to help you out. Most cyclists are very excited to help new riders. Helping someone discover cycling is considered extremely good karma in the cycling world. That’s one of the awesome things about cycling, the sense of community. An experienced cyclist can help you evaluate your options and guide you to the best value for your money. They can talk you through features like gearing and speeds, disc brakes vs. rim brakes and steel vs. aluminum vs. carbon fiber frame construction. They can help you shop smart when finding a new bike or evaluate the quality of a used bike. They also know what you need to be comfortable on a bike. I was lucky enough to have Coach Kadir take me bike shopping. His help made all the difference because I knew less than nothing when I bought my first bike. Find a highly recommended local bike shop (LBS). In this online shopping world, I’m going to suggest something radical. Use the internet for research only when buying your first bike. The very best option is to visit your local bike shop. A good local bike shop will have knowledgeable employees, good quality bikes and accessories, cycling clothing and shoes, and life-saving service and repair. A good LBS will ask you about your cycling experience, what type of riding you want to do, and where you plan to ride. They will take your price range into account. They will have good mechanics to service and repair the bikes they sell. They will also do a basic bike fit for you, so that you are comfortable in the saddle. Good LBSs know that if they get you set up for success, you will be a loyal customer for life. 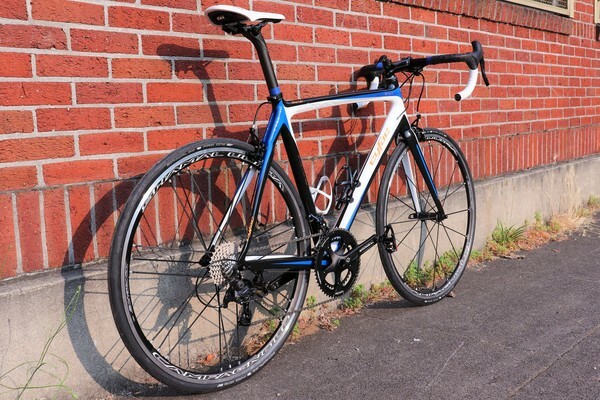 However, if you run into someone who tries to upsell you a $12,000 carbon fiber road bike as your first bike, RUN AWAY. Here in Portland Oregon, Coach took me to a truly excellent LBS called West End Bikes. Mark Ontiveros, the owner, helped me find the right bike. He set it up to fit my body. He guided me to the right survival accessories like a bike pump, spare tubes, front and back lights. He even gave me advice on when and how to lube the chain and a quick demo on how to change a tire. It was the best customer service I have had anywhere for anything, period. Get a bike built for what you want to do. You want a decent quality bike with the right frame geometry and components that help you achieve your basic goals. The right kind of bike will put you in the correct and most comfortable riding position. Sometimes there are interchangeable names for types of bikes. For example, Gravel Bikes are sometime called Adventure Bikes. Mountain Bikes is now a category descriptor for many types of different off-road bikes. Road.cc has a great article that shows and describes the basic bike types. Get a bike that fits your body. This means that you buy the correct size frame for your height, leg length and weight. Small riders will have oodles of choices. If you are a larger rider, your life will be a little harder. See my note below. Note that road and mountain bike categories are usually sized differently. There are online sizing charts from many different sources that will give you a general idea of what size bike you should be looking for. However, please use these online charts with a grain of salt. Certain charts are set up to sell you a specific solution and each big bike brand has their own sizing chart. Some companies use inches, some centimeters, and others use arbitrary sizes like S, M, L, XL, XXL. Bikes have changed a lot since the days of those step-through frames designed for women with long skirts. Bikes marketed to women have more differences than cosmetic things like female-friendly colors and a wicker basket attached to the handlebars. There are design differences than can make difference in fit and comfort. Bikes designed for women often have narrower handlebars for slimmer shoulder widths, slanted top tubes for easier mounting and shorter top tubes to better match torso length and reach. Finally, saddle shape and width can make a big difference in riding comfort. The bottom line is that every person is shaped differently. Choose a bike that is most comfortable for you. Try different bike and saddle options. Women often ride men’s bikes. Some manufactures only make unisex bikes. You are not limited by a manufacturer’s perception of the right design for your gender. Considerations for larger riders (Athenas and Clydesdales). If you are over 6’4” and or weigh more than 200lbs., you may have to work a bit harder to find a bike that works for you. This shouldn’t be a surprise for any big and tall person. It is just the life we lead. The range of bikes models that support tall riders is limited. Also, most bikes have a recommended weight limit. If you are heavy, you must ensure you fall in the range set by the manufacturer for your bike model. If you fall out of this range, the bike may not be safe, and the manufacturer may void the warranty if your frame or other critical component fails. PLEASE, DO NOT GET DISCOURAGED. I’ve seen riders in the 400+ range out there having a blast. Cycling is often the very best sport for larger people with plantar fasciitis, knee and ankle issues. I am 6’6.5” and when I started cycling I was over 270lbs. Cycling helped me lose 50lbs! Your local bike shop will be able to recommend or research what bike models will work best for you. Also, there are things you can do to harden your bike for your weight. For example, you can buy more robust wheels with more and heavier spokes. Here’s a great article from Bicycle.com on the subject. Be assured my Athena and Clydesdale friends, there is a solution out there for you. Fit the bike to you. Your local bike shop should give you a basic bike fit. This means helping you get a saddle that is the correct width/length and setting your seat post and handlebars at a comfortable height. It is important to know this isn't the full-boat professional bike fit you should invest in after you have a bit more experience. When you first start riding, your body adapts to the bike. However, there is a limit to this. After a while, your bike fit will need further refinement. If you get persistent back pain, knee pain, shoulder pain, etc. it is time to refine your fit to match your body mechanics. A professional bike fit can also help you maximize the power you can apply to the pedals and improve your aerodynamic position on the bike, so you can go faster. There are some other “parts/features” to consider when buying your bike. You can purchase some separately. Others rely on what manufacturer has designed the model of your bike to support. Pedals: Most bikes come with flats, pedals designed for street shoes. However, if you are ambitious, you can buy clipless pedals. I bought pedals that were flat on one side and had SPD clipless on the other side. This let me ride in any circumstance and get comfortable before going clipless. Clipless requires special shoes as well. It is super easy to swap out pedals. For now, don’t worry! Going clipless is a natural step in the future and I will guide you through the benefits and considerations in a future blog. Fenders: Do you plan to ride in the rain or snow? Make sure your bike will support fenders. Indoor trainer: Do you want to spin along as you watch television or ride inside when it is dark, or the weather is bad? Make sure your bike will fit on a standard bike trainer. Rear Rack: Do you want to carry stuff home from work or the store? Make sure your bike supports panniers or a rear rack. Water bottles and cages: Do you plan to take long rides? Make sure your bike frame supports TWO water bottle cages. Bike lights: For safety when you ride, you should always have a bright clear light on the front of your bike and red blinking light on the rear. This will help cars and pedestrians see you on the road or in traffic. Helmet: You need a good fitting helmet. Period. It’s best if you can get a helmet with MIPS. See our cycling tip on this topic. If you ride without a helmet, you are an idiot. Sanctioned cycling events require riders to wear helmets. Why? Because they can’t get insurance without this requirement. This risk is too high. I realize this is a lot of information to digest. Buying a bicycle is a “considered” decision. The more research and work you do up front, the better your purchase will be. Buying a bike should never be an impulse purchase. Take your time. Visit several local bike shops to check out different models and find a place that treats you like gold. Drag along that friend who won’t shut up about cycling. They can help. Also, I need some good karma. Let me know if this advice was helpful. Nothing would make me happier than if you find a bike that you love. Next Blog: Your first ride and dealing with insecurities.